'Blues Is a Woman' happens on Sunday, May 14, at Cinnabar Theater, 3333 Petaluma Blvd. N., Petaluma. 7:30pm. $15–$30. 707.763.8920. ALL EARS Pamela Rose (bottom center) introduces lesser-known female musicians to new audiences. Growing up, vocalist and songwriter Pamela Rose didn't want to be Doris Day; she wanted to be Aretha Franklin. 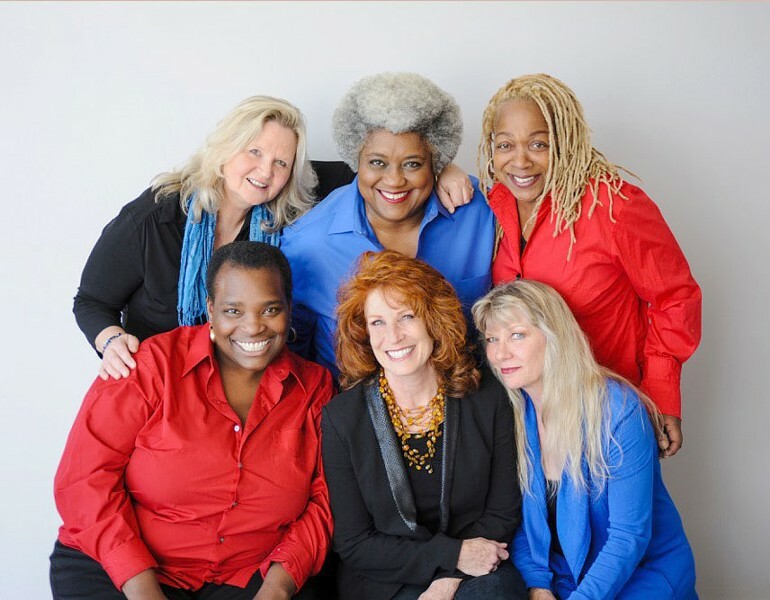 The San Francisco–based jazz and blues star celebrates several powerful female figures of music this weekend with her new show, "Blues Is a Woman," that features a genre-spanning selection of music performed by a stellar ensemble. Best known for her long-touring project "Wild Women of Song: Great Gal Composers of the Jazz Era," Rose has spent the last two years creating "Blues Is a Woman" to shine a spotlight on often overlooked women singers and songwriters. "Blues is thought of as a man's world," Rose says. "But the history shows that women really were the early popularizers of the form." Rose points to long-forgotten vaudeville and minstrel-show stars like Ma Rainey and Ida Cox, who toured the country at the turn of the 20th century, singing the earliest forms of blues and developing the genre's emotional impact. From there, stars like Nina Simone and Etta James dominated charts in their time, though they rarely got the accolades that male contemporaries like B. B. King or Muddy Waters received. Rose seeks to reintroduce these women to audiences with the new show, which traverses several eras of music, from boogie-woogie and big-band songs, to early R&B and even psychedelic protest songs made famous by vocalists like Janis Joplin. "I knew when I wrote this show, I wanted an ensemble piece that was much more theatrical," Rose says. In that vein, she recruited a cast of players to bring the blues to life. Her longtime accompanist, pianist Tammy Hall, joined the project as musical director, and theatrical director and writer Jayne Wenger took over staging duties. Rose also assembled a band that includes guitarist Pat Wilder, bassist Ruth Davies, drummer Daria "Shani" Johnson and saxophonist Kristen Strom. Together the band has developed "Blues Is a Woman" into an engaging and inspirational concert experience that includes visuals and a rich theatrical arch, and Rose hopes to tour the show in the way she toured "Wild Women of Song" nationally for several years. Just as women informed the lexicon of blues, Rose also notes that blues informed generations of women. "These songs have always been about freedom," Rose says. "Blues really changed all American music, especially for women. It presented a very different view of what a woman could be: fierce, raw, feisty and independent. It made you feel that you were not the only one to feel that way. "You were not alone. And that feels good."